12 geotechnical borings were part of our scope, they ranged in depth from 100 feet to 410 feet with overburden ranging from 70 feet to 110 feet. Environmental sampling was performed in 6 of the borings and included the containerization of all soil cuttings and drilling fluids. The drilling fluid was collected from both the overburden and the rock core. Of the six environmental borings three of them were drilled to depths exceeding 300’. A total of approximately 3,987 feet of HQ3-size rock was cored during the project using a split inner, triple tube core barrel. All of the rock was classified and photographed while still within the split inners. Approximately 273 hours of Packer testing was performed, all of which utilized a transducer within the testing zone. Our packer system also includes the traditional surface gauges that are used to confirm the accuracy of the transducer. We installed piezometers in 17 of the 18 borings for a total piezometers footage of 7,786 feet. 7NT personnel installed four 2inch PVC standpipe piezometers. Three vibrating wire transducers were placed at different elevations in each boring (i.e. 370, 290, 130 feet below the grounds surface.) Each piezometer was completed with a flush mounted protective cover and a 2’ x 2’ concrete pad stamped for identification. The major complication while drilling included the encountering of methane gas. Pockets of natural gas created conditions that forced us to delay the drilling and the setting of piezometers. The delays, when encountered, lasted from a few hours to as much as seven days. In all cases we were equipped with enough tooling to move to the next boring and return once the methane was no longer an issue. 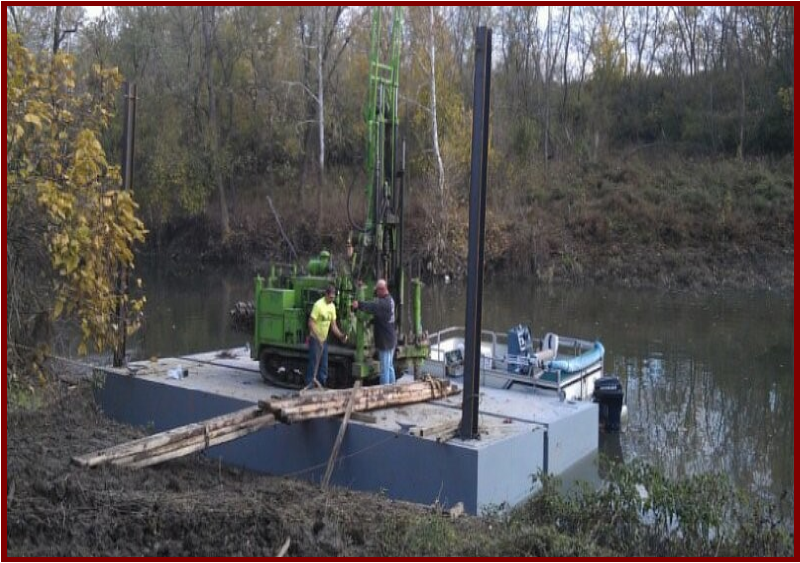 The drilling schedule for this project required the use of 3 rigs at one time and was completed on schedule and under budget.